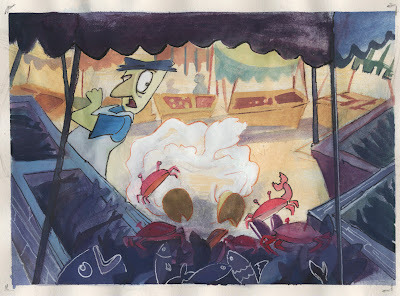 so me and Magnus are working together on our third year pitch.. making a good story for a two minute, animated short is sooo difficult, but we are getting there.. this is a gouache small painting i did as part of visual development.. i've been looking at the style of mairy blair and lorelay bove (an amazing calarts graduate).. playing around with gouache is fun but need to work a lot more till im finally good at it..
thanks buddy! im glad u like it! i still need to work a lot at getting better doing concept.. it is hard!